Sometimes the most interesting things happen purely by accident. One such event occurred the other night when I was putzing around in the underground Particle Lounge by myself. As usual, some shoppers were browsing in the store above me. By chance, I peeked upstairs and noticed a Linden was present! I often chat with customers, and if a Linden was there, well, why not have a chat with them? So I proceeded up and encountered Enkidu Linden, whom I had not dealt with before. Enkidu is a new Linden, having been rezzed only on Halloween 2008. We had a long and interesting discussion about many things during the visit. However, it turns out that Enkidu is a particle fan, and was having a great time testing the live demonstrations at the store. He liked many of the items, and said he’s been trying to build some himself. I expressed interest in his particle construction ventures, and he wanted to show me his efforts. 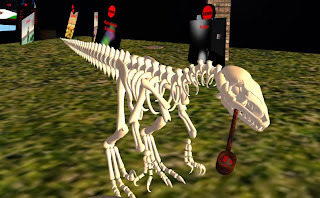 He proceeded to switch avatars into a Raptor skeleton with a corn cob pipe. The particles? It was smoke from his pipe. Enkidu’s smoke was, well, pretty lame. That’s not surprising, as it takes a while to figure out how to do particles properly. But these were so lame that I just had to do something. I quickly whipped up some smooth smoke puffs for Enkidu, and gave the script over. A long-standing project of mine is something called “The Particle Lounge”. It is a place where I can hold events, parties and have people over to chill. The original Particle Lounge was kind of an experiment, where I tried various particle effects and other visual techniques to create a spooky, eerie place like no other. I think it succeeded. But then I expanded my shop, and the Lounge had to go. I placed it high in the air, thinking that it would be just as easy to use. It turns out that it was not easy to use. Out of sight, out of mind, I suppose. So there it sat, floating up in the sky unused. I wanted to believe I could do better than that, and after some out-of-the-box thinking, I realized I could build a new Particle Lounge - underground! Well, it’s not exactly underground, but it is simply under the floor of my shop; the ground there is quite sloped and I realized there was sufficient space under the floor to build something big. So I did. The new lounge turned out even better than its prior iterations. It’s larger, more carefully built, and takes into account all the feedback I received from the last iterations. It was so cool we thought we’d better have a party to open it. On two hours notice. Codebastard Redgrave floats above the quad-sun floor in an endless aerial spin. First Question host Pooky Amsterdam looking great as usual. The Slovenian Writers: iYan and iAlja Writer. Blogger, supermodel, virtual wife and compulsive comedian Tymmerie Thorne reaches for an Aetherfish. Good friend Bevan Whitfield in her new dress eyes the guests. Tweeter Caliburn Susanto is suspicious of the Aetherfish. 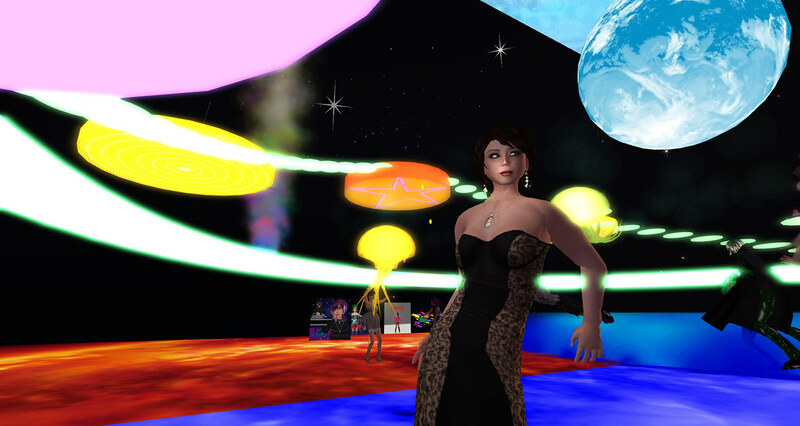 Virtual healthcare specialist Coughran Mayo dances to the music. Was Abba playing at this point? Queen of Green Haley Salomon ponders the not-green floor color. I must mention that a late guest was Jene Tempura. Very late indeed, as he showed up some 12 hours after the party ended, no doubt due to some catastrophic time zone miscalculation. If you’d like to explore the lounge and all its hidden secrets, drop by Electric Pixels anytime. But just watch out for that first step! Last year at SLCC I had the pleasure of speaking at length with Robin Linden, one of the originals at Linden Lab. Sadly, she’s no longer with the company, having moved on to other pursuits. But she’s not alone. Several long-term Lindens have recently departed, most recently Ginsu Yoon and Zee Linden, the CFO. They were all pre-exited by CTO Cory Ondrejka some time ago. 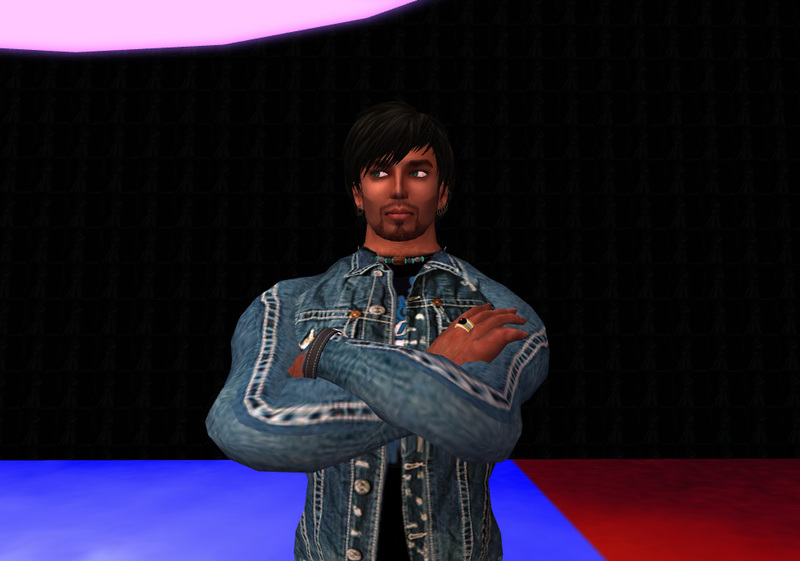 Today we hear a rumor that Lee Linden is about to exit stage left as well. By no means. I believe the universe is unfolding as it should - it is simply the transition of Linden Lab from small start-up company mode to a large-scale operation. Different types of people are needed for each mode. In a startup company, you need highly creative, action oriented people who can quickly make useful things out of whatever they can get their hands on, making up things as they go. That’s quite different than a large-scale company that can’t do that when there are 100,000 times as many things to look after. You have to transform that creative energy into consistent business processes that can scale up to a much larger size. It’s no different than any task you might have to do yourself. For example, It’s really easy to hang a picture on a wall once. But could you do it a million times? Nope, you’d need to hire people who could be trained to do it correctly and consistently each and every time. That’s quite different than just doing it yourself. That’s the transformation that’s happening now at Linden Lab. We’ve all heard complaints about Linden Lab’s activities, but I read it to mean that the original organization’s approach simply reached it’s maximum capacity. The reaction by the shareholders was to begin transitioning the company to a configuration that would be able to handle large-scale activities. A new CEO appears, along with new people with new approaches. Existing staff departs. This always happens to successful companies; they grow until they need to modify their approach to handle larger and larger operations. Failed companies don’t make the transition, so I’m quite happy that Linden Lab is making all these changes. Is this a bad thing for those who are leaving? Perhaps, but on the other hand people who like the wild ups and downs of a startup company might not enjoy working at a more regimented “larger company” that pursues consistency, so perhaps some of those leaving have gone seeking other new startups where their talents are are more suitable. In the long run, what does this mean? I think it means that Linden Lab is getting themselves organized for a truly massive expansion in the future. You think 88,000 concurrent users is something? It is for now, but it’s nothing compared to what’s going to come. The last few weeks have been rather hectic. I’ve been quite busy spending many hours cataloging SL blogs, coordinating the blog inspection team, researching unemployment rates, calculating revenue rates, navigating various painful dramas, preparing for several grid hunts, building gift items and rebuilding something underground. It was a seemingly endless stream of work, tasks and trouble. By chance, a friend had purchased a rather unusual object: a gigantic champagne bottle, equipped with a full glass of said fluid. When rezzed, the glass included active bubbles and was truly larger than a bathtub. I admit that in real life, I rarely get a chance to take a bath in champagne, and even more rarely in a gigantic champagne glass. This particular glass included a dance animation. Spurred on by my alleged friends, I reluctantly sat upon the glass and began to dance. Immediately, I noticed something horribly wrong: the dances were not exactly my style. I just don’t do sultry dips and swoops in champagne. Fancy prances with knees high around the glass. Suggestive bendy-overs across the lip of the glass. Hrmph. But I didn’t hit the “Stand Up” button, as I’d usually do in mere microseconds when faced with such a terribly embarrassing SL moment. Instead, I giggled. A lot. After a long while, I felt a smile on my face, and realized something had happened. Something wonderful. I was having fun. 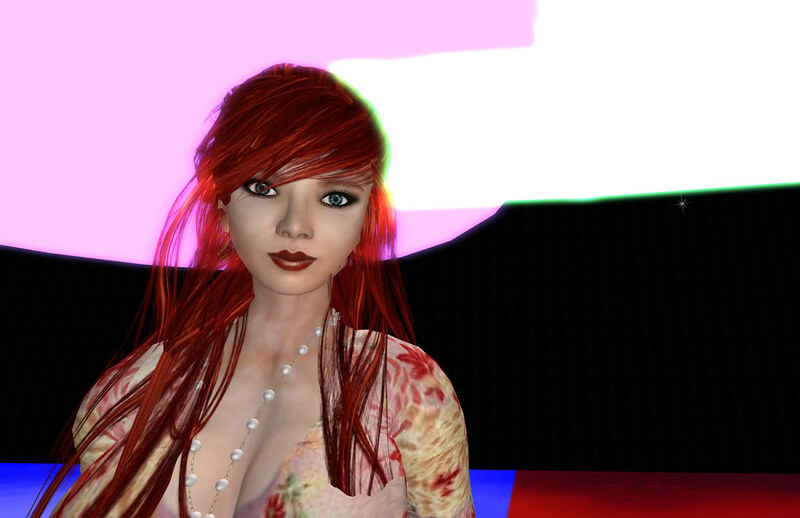 Fun with the unreality of Second Life, doing things that are impossible in real life. 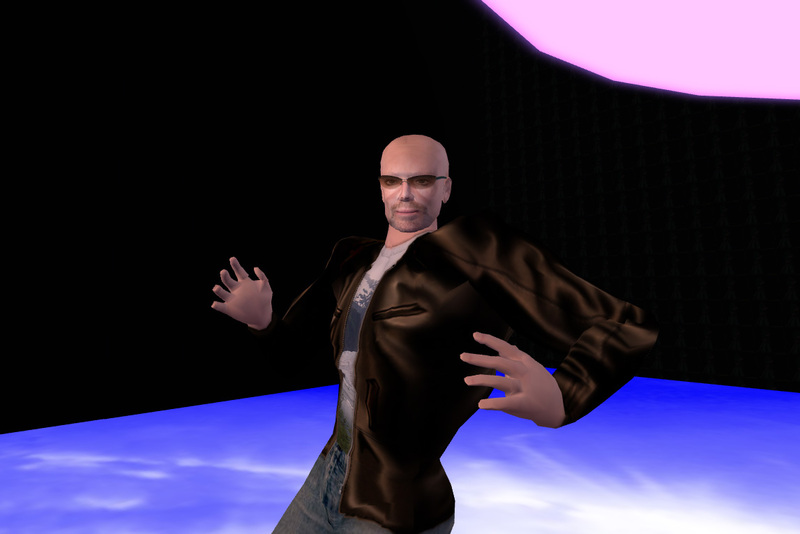 Things that are silly even in the insane universe that is Second Life. The very things that caused me to explore, learn and be amazed by our nutty virtual world so very long ago. Somehow I’d managed to find my “reset” button and push it. And a truth was revealed: you gotta have fun. There may be work, trouble or obligations, but none of it is worthwhile unless you’re having fun. This is true not only for Second Life, but even more so in real life. When it stops being fun, it’s time to move on. But not this time. I’m still here, working. With a smile. P.S. If you'd like to try out the champagne yourself and see if you can find your own reset, drop by anytime. To counteract the trend, I’ve been conducting all sorts of different business experiments, such as different advertising, new products, and even entering Grid-Wide Hunts (which, by the way, definitely increase your traffic substantially.) However, none of these actions has significantly affected the decreasing revenue trend. More research was in order, and I came up with the graph above. 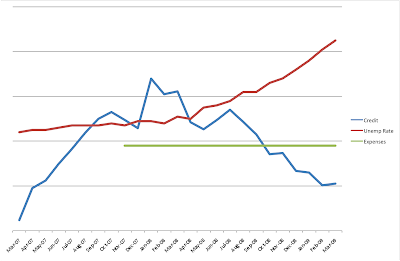 The Blue Line is the revenue. As I began operations in early 2007, the business slowly grew, and it seemed to reach a bumpy plateau through September 2007 through August 2008. From then on things just went south, with little effect from any of the business experiments. However, the interesting part is the Red Line. 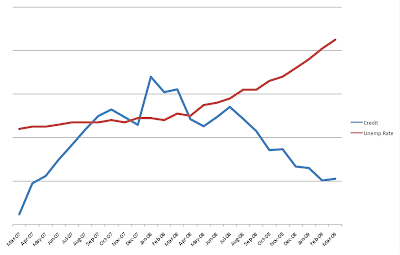 It’s the United States Unemployment Rate, scaled to fit overtop of the revenue line. 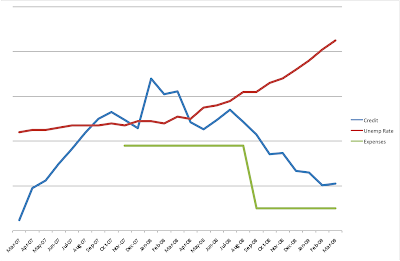 The unemployment remained more or less constant until, guess what, June-July 2008 and kept rising thereafter. At that moment, my revenue started to fall. It appears that there is a direct correlation between US unemployment and SL revenue, at least at my shop. Revenue seems to be inversely proportional to unemployment. This intuitively makes sense. As increasing numbers of people become unemployed in the US (and presumably elsewhere to varying degrees), they cut back on non-essential spending, including Second Life. Thus, overall revenue decreases. Is this the same for all SL stores? I don’t think so. Like Real Life, different products and services are needed at different moments in time. Who wouldn't want to be a repo-man these days? I am certain there are several thriving markets still going strong in SL, but in my case much of my product is (was) sold to those building new sims. And we know what happened to that activity. Now here’s the interesting bit. Suppose we add another line to the chart, representing expenses. As I’ve said many times before, revenues must always exceed expenses. Suppose our expenses were as represented by the Green Line. We would have been losing money starting last October, and probably given up shortly thereafter. I believe this is what has happened to many businesses in SL over the past few months. More than a few businesses were operating on a just-barely-breaking-even basis, and a financial storm such as we’re experiencing would kill off many of them. Is there anything that can be done? Yes, certainly. In this theoretical chart we’ve realized something bad was going on and taken quick action to reduce our expenses. Notice that the Green Line is always below the Blue Line. This is the only way to survive. In some cases the amount of expense cutting may have been too much for the business to survive, and those business expired anyway. But how does one cut expenses? That’s a topic for another post, stay tuned, dear readers. Is this all bad news? I don’t think so. We’re witnessing in SL today a process of evolution within the business community. The less efficient businesses have either died off or must become much more efficient. The well run businesses will survive. When the smoke clears, we’ll have a virtual world filled with well-run, highly efficient businesses ready to take on anything. And that can only be good. [UPDATE April 2009] I've sifted through the numerous comments and feedback and added a few missing blogs in a special list at the very bottom. Thanks for your suggestions! 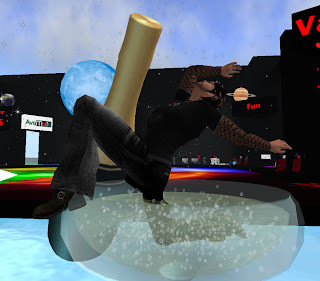 After last week’s update, we received so much feedback and so many suggestions that we have prepared yet another even more extensive list of Second Life blogs. But this will be the last time. The unfortunate part is that verification of these characteristics cannot easily be automated. As a result, the 2,101 unique URLs had to be inspected by hand. That’s right - we briefly examined (although sometimes for only a few seconds) each of them. And I say “we”, because this was not something anyone could (or should) attempt on their own. Our international team of blog inspectors included: Amber Decuir, Thickbrick Sleaford, Peter Stindberg, Haley Salomon, Moggs Oceanlane, Quaintly Tuquiri, Radar Masukami, Andrew M and myself who all spent many, many hours this week viewing blogs, checking results, writing/running scripts and compiling results. When the smoke cleared, it appears we have 1,202 active Second Life blogs at this moment in time. Is this for certain? No - in spite of the comprehensive approach, it is certain we missed some. We may have also made typographical errors, which are impossible to completely eliminate while manually handling over two thousand items. 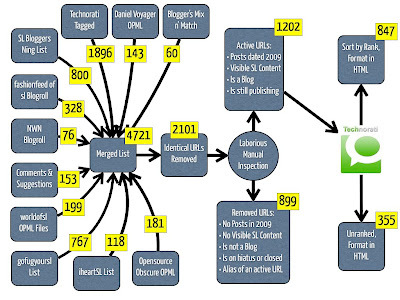 Worse, based on our manual inspection it appears that every day several Second Life blogs are born, fade or disappear. Finally, the Technorati rankings, which I should emphasize are based on links and not based on traffic, also vary from day to day as links are added and removed. Our apologies in advance to anyone who’s been missed. Know there are many incredibly useful websites that just don’t happen to be blogs or are not really focused on Second Life. 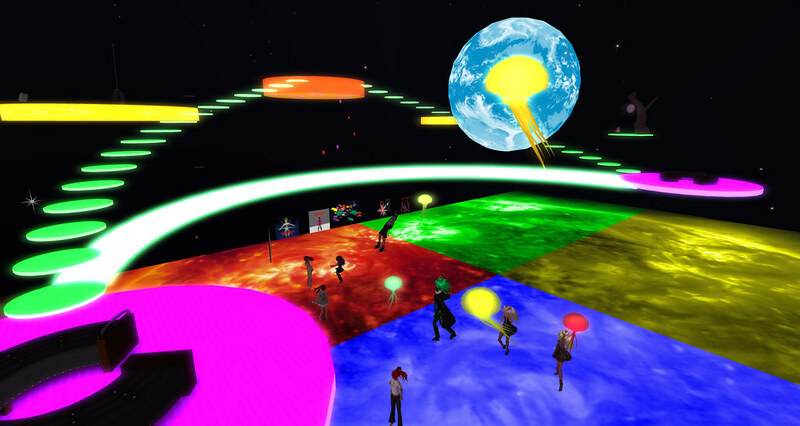 But these lists include only Active Second Life Blogs. The ranking is important only if you believe it to be. If your blog achieves its purpose, then rank doesn’t matter. You should know that in the course of reviewing URLs we discovered many truly wonderful blogs that by chance were not ranked high. What happens next? Preparation of these lists required vastly more work than ever anticipated, and we will not do this list again until next year. Some have suggested transforming this list into a giant feed, somehow automating it, etc., but we just don’t have the energy left to attempt any of that at this time. ( 21 ) Metaversally Speaking..
( 40 ) Are we not men? ( 40 ) JUICYBOMB | Be Juicy, Second Life! ( 54 ) What's New ? ( 55 ) What *IS* Willis Talking About? ( 58 ) Through my eyes..
( 61 ) Eladrienne's Other Life! ( 64 ) Who let the dorks out? ( 65 ) MANZANA QUE NO! ( 73 ) Whole Lotta Rosie! ( 76 ) mayaka beck_Shopassist! ( 76 ) SL Things To Do | Where do you want to TP today? ( 77 ) Beanie Loves Japan! ( 77 ) Unique Needs! ( 84 ) ..:: JM Models ::..
( 91 ) Ammon Who? ( 91 ) DragonFly Designs,Inc. ( 95 ) I'm a Gracie Girl!! ( 95 ) KANADA Co.,Ltd. ( 96 ) Viva La Glam. ( 99 ) Bring back Grimmy! ( 106 ) Kefrens LOWE. ( 108 ) . :::: dEVOL ::::. Cyan Blast where Cyan comes to have a Blast! I have nothing to wear! Oh do I? Life on the [kD] list. Lookr.co.uk | Reach Out and Touch. Marianne Dover « Because I like it! Namiko Surf Co. | surf second life. change real life.